Since settling in Taiwan it’s been my great joy to discover that this tiny island has given the world two wonderful modern sci-fi authors in Charles Yu and Wesley Chu. The affinity I feel for this place makes me wish to claim them as my own kin, undeserving as I am to do so. However until now I had remained ignorant of any science fiction in Taiwan’s literary history. Fortunately I stumbled, by complete accident, on this collection of short fiction by Huang Fan, apparently a widely celebrated author on these shores. After rattling through the precious few pages at pace I’m glad to say my love for my new home’s creative past has only increased. Ignoring European intervention, the island played host to pirates, aborigines and settlers from China for many years. However, it was in the closing years of the 19th Century when things started to get interesting. China, having made a half-hearted attempt to claim Taiwan as its own, admitted that it controlled but a small fraction of the island and Japan stepped in. Life under Japanese rule was very far from perfect. They were strict masters and particularly harsh when it came to dealing with the tribal groups, by now pretty much limited to the mountains running down the island’s spine. However there is still a fondness for those years felt by many elderly Taiwanese and the Japanese did indeed bring many benefits, from growing the economy and building infrastructure to creating one of the finest education systems in Asia at the time. There is little doubt that Taiwan would still be in a pretty poor state without Japan’s intervention. However following World War 2 things fell apart. The peace treaty required Japan to return the island (among others) to its original owners. This itself is a sticking point as China admitted to never having truly owned the island. Furthermore the civil war in China resulted in the old guard, calling themselves the Republic Of China and represented by the modern-day KMT party, retreating from the Communist forces on the mainland to plan their eventual return and victory. As soon as they arrived they were essentially installed by the allied forces as Taiwan’s new rulers, sparking off events which would soon lead to the darkest period this country has ever known. Life under the KMT was closer to East Germany than anything the population had ever experienced. While corrupt officials and troops from China proceeded to strip the country bare of assets in every crooked way imaginable they also suppressed any dissent. Anyone suspected of dissatisfaction with the government could be imprisoned and executed – this happened to people by the tens of thousands and the body count was racked up by the party which currently governs the country. Communist sympathisers and their acquaintances, like-minded or not, were subject to all manner of torture, as were those who advocated Taiwanese independence over subjugation under China. The country endured under martial law until very recently when a fledgling and very much imperfect democracy appeared. It was under these conditions in which Huang Fan wrote Zero and the three other stories in this volume, explaining why he remained unheard of until the lifting of martial law in the 1980s. The short fictions presented here, translated with a wonderful eye for wit and satire by John Balcom, represent Huang Fan’s wide range of styles. The first, Lai Suo, is told through the eyes of the titular protagonist. The narrative jumps back and forth through his life, a man unstuck in time in a manner reminiscent of Kurt Vonnegut. As the story unfolds we develop a picture of a man almost entirely lacking in agency, being buffeted back and forth by forces outwith his control. He is used as a stepping stone to higher places by an acquaintance and the razor-sharp prose really instills a sense of helplessness. In An Intelligent Man we are shown an allegory for Taiwanese emigration around the globe. The man of the title builds an antique furniture empire in America but soon realises its limitations and yearns to spread further afield. Before long his operations stretch to Japan and China as well, but with unfortunate complications. His wife in America, unable to provide him with the son he desires, soon learns that his business trips aren’t all business. There’s a really light, humorous touch to the tale despite its dark subject matter. How To Measure The Width Of A Ditch is a delightfully playful and inventive absurdist piece in which Huang Fan breaks the fourth wall and drags the reader into the narrative itself. I’m not even going to begin to describe it, except to say that I had a wide grin on my face the whole way through. However it is Zero itself which is the undoubted lynchpin of the collection and the longest piece by quite a way. A classic dystopian fiction in the vein of 1984 it even goes so far as to namecheck Orwell’s hero, naming him as the author of a mysterious text which the protagonist stumbles across following a series of dreams. Set in a near future world where near perfect harmony has been achieved and violence banished to the past we jump into the life of Xi De, a resource analyst in Taiwan. Having graduated from a superior academy, Xi De is one of society’s elite, never left to want for anything although the same is true to a certain extent of the entire population. However, Xi De soon realises that something is amiss, that there is a spiritual gulf in this paradise of equality. A kind of malaise sets in until he finally comes into contact with a friend of an old professor who confides in Xi De that he is right and there is something rotten at the core of their brave new world. Bleak and unforgiving, Zero is clearly a product of the time and conditions in which it was written and provides a deep insight into life under the vicious hands of the KMT and martial law. On their own merit these stories deserve far more attention than they seem to have received in international circles. Huang Fan is clearly a gifted author who can turn his hand to many contrasting styles and who is not afraid to cut straight to the core of a matter. The extremely short length of the collection only serves to make it all the more accessible and the translation is a wonderful example of the art. 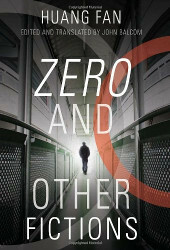 However for anyone who has adopted Taiwan as their home and wishes to discover more of its culture, or for those with a passing interest in Asian history, I can’t recommend Zero And Other Fictions strongly enough. Required reading for anyone staying here more than a couple of years.